Our Precision Outside Circumference Tapes are available in the Blue Easy to Read material (as shown). 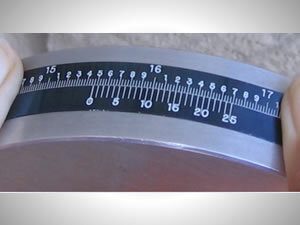 Standard tapes are manufactured with a 1/4" wide Vernier Gage, a 1/2" wide Main Body and a 1/4" wide Gage Member. The standard thickness is .010" with an accuracy of ± .005" up to 120". Calibration Report traceable to N.I.S.T. is furnished with each new tape at no additional charge. Our calibration lab is compliant with ANSI/NCSL Z540-1-1994, ISO/IEC 17025, ISO 10012-1, former MIL-STD 45662A and 10CFR21.Larger sizes and special widths can be manufactured to suit your requirements.